The corridor darkens – there is no electric light here, just as there is no gas and no running water. Already my nostrils are wrinkling from the assault of the soap balls from Bon Marchè, put down to kill the smell from the abattoir. I walk on past the first studios, which being nearest the door are also the cheapest. Here is the Litvak Kikoine, then the bourgeois Indenbaum, my fellow from Vitebsk. Then next along the corridor, Avram Markovich. There is a sprawling pile of rubbish outside his door. Then the bitter Krémègne. The beautiful Amedeo Modigliani – Modi – is now on the ground floor, too, where all the sculpture studios are, since he made his wild decision to stop painting and be a sculptor. I reach my door. I moved to this atelier only recently. I used to be next door to Modi, but the screams of ecstasy from his many lovers was distracting from both sleep and work. Faintly in the distance I could hear Kisling’s phonograph playing tinny notes, just above the sound of my own breathing. All the studios have a letter on the door. Mine is the letter A. None of the ateliers at La Ruche have locks. People wander in and out. Thefts of paint, canvases, food and clothes happen all the time. I hate that. I myself do not steal; I do not expect to be stolen from. Every time I go out, I wind a piece of old wire round the door handle then jam it in the door jamb as I shut the door. It would only delay an interloper for seconds, I realise that, but most of the painter-magpie-thieves have at least a modicum of embarrassment about stealing from their fellows, so a few seconds hold up, making their crime obvious to a passer-by, might be enough. Or so I hoped. Sinking dread swept through me. The wire had definitely been tampered with – no doubt, no doubt at all. It was hanging down. I had not left it hanging down. I tried to persuade myself I had left it hanging down, but I had not. I loosened the wire, put it in the pocket of my blue linen jacket and went into my studio. I saw nothing, because my eyes were shut in fear. I was even trembling, slightly. I could smell the mix of linseed oil, turpentine and my own sweat which told me I was home. I slammed the studio door shut behind me, as if to shut out the intruder I feared had already got in. I looked round wildly. The first check was always the brushes. Thanks to the Vinaver largesse, I could afford a couple of sable brushes. I also had a hog’s hair filbert for close work, much envied by some. They were both still there, still caked with paint, in fact, from the Self Portrait with Seven Fingers, the painting I was working on at the time. There was permanent white from my painted nose on the little filbert, cadmium yellow for the floorboards on the sable. Then I lost myself for a while staring at my painting of The Cattle Dealer. The cattle dealer is sitting on a cart, being pulled by a horse. A cow is riding on the cart. The cattle dealer’s wife is walking behind the cart, carrying a calf. The wife is painted as larger than the man and the cart because size means importance. The cattle dealer is twisted in his seat looking back to where they have come from. The wife’s head is also twisted, looking back. Even the cow on the cart is facing the way they have come, not the way they are going. Only the horse, the means of impulsion, is facing forward. This is what I am saying: Marc Chagall, the grandson of a cattle dealer, is being pulled forward into his life in Paris but he and his beloved Bella are looking back to Vitebsk. The overall message, however, is a glorious pantheistic statement: The cow has the spark of the divine so is entitled to her place of honour and rest on the cart. I breathed out, then breathed hard, steadying myself. I was sweating. The Cattle Dealer was untouched, I was sure of it. I lit the kerosene lamp and looked round the studio. Studios at The Hive were not called ‘the coffin’ for nothing, air was one of many shortages. Everything in here is shaped by the hexagons which honeycomb together to form the basic hive shape of the building. Each atelier, each studio, is one such hexagon. To make the most of the natural light, painters who use it to paint (I don’t, I paint at night) have to pose models at the summit of the triangle shape, below a ‘metro’ shaped arch with a window above it. All the studios are like this, all identical. My breathing slowed, although I could still hear it. I could hear a distant train clatter past through the Gare de Montparnasse, too. Then the silence landed. I let my eyes sweep round my oddly-shaped world, a world full of corners and angles. The bed is upstairs on a balcony, where a bay overlooks the garden. Like everything else, it has been there for more than ten battered years. It is reached by a scuffed and scraped stepladder. I was the bed’s sole inhabitant, a thought I did not let myself dwell on. Want to read on? Buy The White Crucifixion from the top of this page, bookshops or Amazon. The White Crucifixion starts with Chagall’s difficult birth in Vitebsk 1887, in the present-day Belarus, and tells the surprising story of how the eldest son of a herring schlepper became enrolled in art school where he quickly gained a reputation as ‘Moyshe, the pai nting wonder’. In 1913 Chagall relished the opportunity to move to Paris to take up residence in the artist colony ‘The Hive’ (La Ruche). The Yiddish-speaking artists (Ėcole Juive) living there were all poor. The Hive had no electric light, or running water and yet many of its artists were to become famous, among them Amedeo Modigliani, Chaim Soutine and Osip Zadkine. When Chagall’s great love Bella moves into the Hive, he muses: Yes, I am in love, yes I am happy, but I am and I remain an artist, a painter, first and foremost. I cannot lose the totality of myself in Bella because something of me must always remain outside and aloof from anything which is not my art. In 1914 Chagall and his wife Bella made what was supposed to be a fleeting visit to his beloved Vitebsk, only to be trapped there by the outbreak of the First World War, the subsequent Russian revolution and the establishment of the communist regime which was increasingly hostile towards artists like Chagall. Yet, Chagall kept on painting, and the novel provides a fascinating account of what inspired some of his greatest work. He eventually managed to return to France, only to be thwarted by another world war which proved disastrous for the people he knew in Vitebsk, the people in his paintings, including his uncle Neuch, the original ‘fiddler on the roof’. The White Crucifixion is a fictionalised account of the roller-coaster life in terrible times of one of the most enigmatic artists of the twentieth century. Enjoy these pictures from the launch party at the Artworkers Guild. 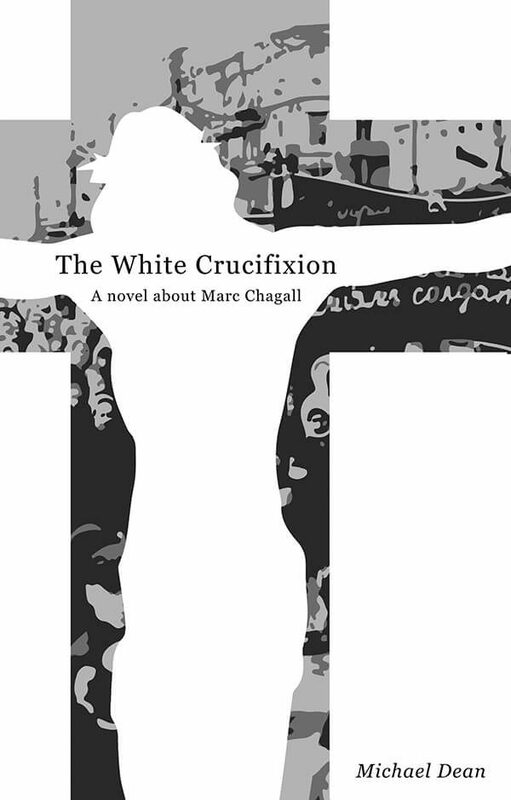 The White Crucifixion was published on 22 February 2018. For more information or review copies please contact the publisher: bernadette@hollandparkpress.co.uk, +44(0)7792611929. ‘This novel demonstrates considerable skill in uniting ‘large canvas’ political events of the early 20th century with the intimate scale of individual experience and creative endeavour. ‘The book will be of interest to anyone wishing to learn about Chagall and what inspired some of his greatest work.